Gill Preston, founder of Wild Things, is bringing a Summer Activities Club for 8 – 12 year olds to Martineau Gardens this August. Here, she explains the activities that she will be running at the Gardens this summer. Each day begins at 10am and ends at 4pm and the following dates are available throughout August. Alternatively you can book shorter sessions, on the same dates, 10am – 12 pm or 2pm – 4pm. 1st, 2nd, 8th, 9th, 15th, 16th, 22nd, 23rd and 29th, 30th. The cost per child per full day is £25, (or £10 for shorter sessions) there are some concessions available, please contact Gill Preston for details. Parents / carers are not expected to stay at Martineau Gardens during the session. Book your child’s place for a fun day in the beautiful setting of Martineau Gardens in the heart of Birmingham. Have fun compiling some information for the aliens about the different types of trees at the Gardens. Find out if there is a relationship between how wide a tree trunk is and the size and shape of its leaves! The Femtinos find the bird creatures of Planet Earth fascinating. Help the aliens compile a record of all the lovely birds we see in the gardens and create some colourful collages with feathers and craft materials. The aliens have hidden letters around the gardens. Work in teams to explore what the gardens have to offer and see if you can find all the hidden clues. Also have fun designing your own treasure map and clues. Inquisitive Explorers Ltd reserves the right to alter the contents of the workshops in the event of bad weather. Please ensure children are appropriately dressed for the outdoors. Advance booking is essential. 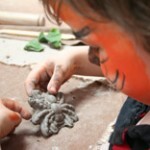 Femtinos at Martineau Gardens, suitable for 2 – 11s, parental/guardian supervision required. Cost is £4 per child. There will be two one-hour sessions each Saturday, 10.30am – 11.30am and 12noon – 1pm, on the following dates: Sat 28 July, 4 August, 11 August, 18 August, 25 August, 1 September. The cost per child, per hours is £5; all age groups are welcome. Parents / guardians should stay at Martineau Gardens during the sessions, where we’re sure you’ll enjoy the therapeutic surroundings. Parents of under 5s will need to stay with their children in the studio and will be given an opportunity to enjoy it as much as the children do. Advance booking essential. 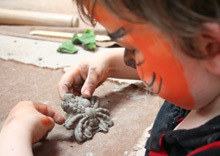 Please book direct with pottery group organiser Linda Harvey on 0758 1783652 or e-mail [email protected] Linda says, “If your child has particular needs, please do not hesitate to inform me – I will do my best to meet their needs”. The information above is correct at time of publication, but for latest details, please check with the organisers direct. Martineau Gardens will continue to be open to the public, as usual, throughout August (except Sundays and the bank holiday on Monday 27 August). For full details of Martineau Gardens’ opening times, click here.